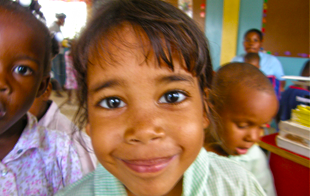 In summer of 2003 we received a request to visit a school that needed a deworming clinic. 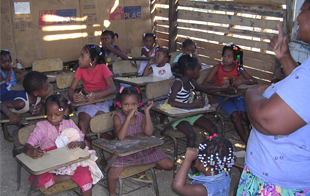 Upon arrival to the village of Jacagua, Villa Mella on the outskirts of Santo Domingo, we found 32 children in a makeshift cardboard and wood slat school house. They used cardboard for the chalkboard and walls, the floors were dirt and old paint chipped school desks were crammed into the small confines of what appeared much like animal stables. Honoria, who has become known as Abuela, meaning Grandmother in Spanish, was singing songs and teaching bible verses to the scantily dressed children in attendance. Most of the children were orphans living with relatives that did not put them in public school due to the burden of cost or problem children who had been booted out of the public school. Others were tiny, not even big enough to crawl that were left by single mothers who went out early in the morning to find work in the city, many not returning until after dark to collect their children. Abuela disciplined the children with love, always had kinds words to speak over them and the smaller ones followed her around, clinging to the pleats in her large skirts, looking much like a mother hen being followed by her chicks. Abuela cooked outside over the coals on the ground in a large pot. Her specialty was Sopa Loca, crazy soup, which consisted of whatever veggies and canned goods that had been donated by the nearby corner stores called Colmados. The soup may contain carrots and chicken one day or spaghetti and sardines in tomato sauce the next. Unaware and unconcerned of its contents, the hungry children lapped it up with joy. Clemencia, Abuela’s 22 yr old daughter, who suffered the sequelea of Rheumatic Fever and Sickle Cell Disease, dressed each day in her proper teaching attire and fulfilled her dream of teaching the next generation. She did so in the makeshift school house although she had never been educated beyond High School due to lack of finances. Many days we would arrive to find her teaching the children to count the hearts she had drawn on the makeshift chalkboards. What she lacked in education she superseded in the Joy of the Lord, always smiling and giving a loving touch to a hurting child. The Lord impressed upon our hearts to build a real schoolhouse for Clemencia and send her to school to fulfill her dreams. Sadly, however, she was prematurely called to heaven by her Lord and Savior. Clemencia left behind two small children, who are now being cared for by Abuela. Clemencia was not able to see the schoolhouse that was built in her honor. It sits where the old structure used to grace the land in front of her small house. The finished and furnished schoolhouse lacks directions due to the loss of Clemencia. Although Abuela has a heart for the children, to give them spiritual food and warm their tummies with a hot meal, she lacks other skills to maintain order in the program. For now, the program serves about 100 kids from the community who arrive for the morning or afternoon tandum, or preschool and nursery ages that are there all day long. 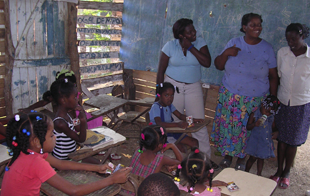 Vision: To evangelize and disciple the community of Jacagua, Villa Mella while serving the families and meeting the needs of the children. We desire to see the schoolhouse be used to it’s full potential to help the children of Jacagua be adequately prepared for the public school which they will ultimately attend. We will provide a head start education to the preschoolers, but serving as a before and after school program to the older children. We are praying for educators and administrators who catch the vision for this ministry to come forward and answer the call. To bring in organization & order to the project itself. Find an educator or administrator to help set policy and procedures. Faithful servants who have a heart to serve in the area of early childhood education and homework/tutoring clinics. Nutritionist to help with the menus, organize the kitchen logistics and meet nutrition and feeding protocols. 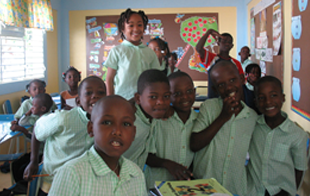 Faithful donors to help cover the cost of running the school and providing food and supplies on a regular basis. Donations of school supplies and classroom equipment. Light construction and handyman work to help revamp the school’s kitchen and bathrooms; painting and curtains; refurbish the school desks. Interns to come and serve on a long-term basis to keep the school running.